What is the phone call that you dread the most……but you hopefully never receive? Yes the one telling you someone in your family has had a bad accident! Having only dealt with major accidents at work I never gave it a second thought how I’d react! Well this summer, on a Thursday evening I was cooking tea. I got one of these calls to say that my husband had had an accident on his bike,(road bike not motorbike) a few miles from home. The voice at the other end said ‘‘he was ok, just some nasty cuts’’. They had called an ambulance and were still waiting for it to arrive, so I turned off the pasta I was cooking (it’s amazing the odd bits of detail you remember!) jumped in the car and went to find him! He didn’t look great when I got there and I knew he had done something serious! I was so angry (how I reacted!) I started shouting at him!! Fortunately he doesn’t remember. I was about to teach a pilates class as well and I hate letting people down! The ambulance still hadn’t arrived so I decided to take him myself. The guys got him up but he couldn’t put any weight on his left leg, not looking good and I knew then I wouldn’t be teaching Pilates that night! The hospital were amazing and soon got him seen too, results that came back were not great, broken pelvis in two places and a broken collar bone. Not unlike Richie Porte a few days earlier in the Tour De France. We found out later he had been doing 32mph! My husband is no youngster, he is in his fifties, but he has always kept fit. He has cycled all his life. Racing a lot in his youth but had taken it up seriously again in the last couple of years. He’d also been doing Pilates regularly for many years, so he was in pretty good shape. His injuries were too serious for the local hospital to deal with so he went via ambulance this time to University Hospital Coventry, the Midlands Trauma Unit. We all knew it was serious at this point. 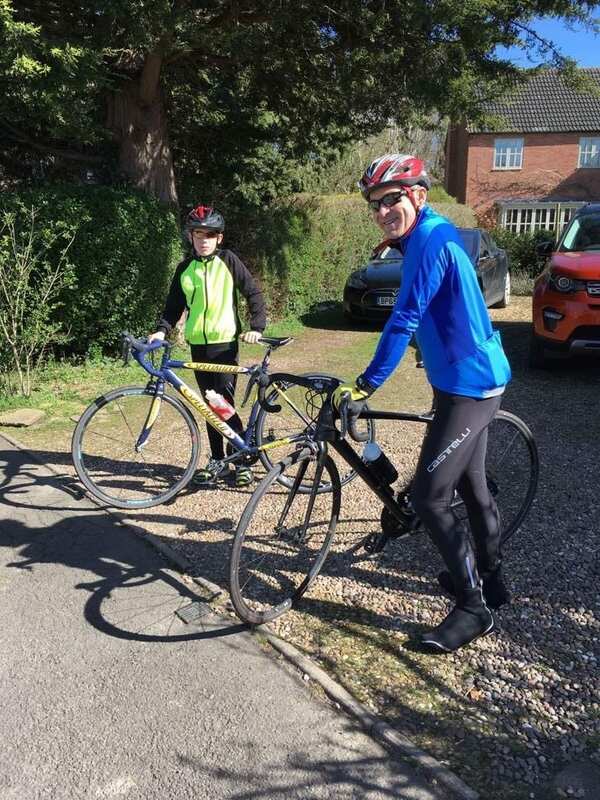 This blog is to describe our journey on his road to recovery to get him back to cycling again. Firstly making him believe that he could! Also the effort he has and is putting in to get himself back to the fitness and strength levels he was before. Things take time but putting in the effort can make a real difference. So back to the hospital now in Coventry. The first few days in hospital were surprising for someone who is always doing something but the body is an amazing thing and knows when it needs to rest. The consultants said his collar bone would heal ok, the pelvis was a concern. It might go back into place, we had to wait and see. More than likely they would need to operate to secure it in place to avoid the need for a hip replacement. The Physiotherapists from the day after the accident started getting him out of bed even though he could barely move. He passed out when he stood up the first couple of times! But they kept at it, even though it was painful, he still had to keep mobile. They were great, always explaining the need to keep moving and to be fair, with the pain he was in, he did as he was asked! They got my husband out of bed each day doing some basic exercises, without putting any load on the broken bones. After the first week the team decided to operate, but this is a big thing for someone who has never been in hospital let alone had an operation! He was fit and strong and this was great for a good recovery after the operation. A lot of people are in poor shape prior to an operation. Either due to choosing a lack of exercise or through a long-term injury. Therefore not being able to exercise, which will make recovery even more difficult and take longer. He had a head start. PreviousPrevious post:Video 18 -After Work Pilates Online VideoNextNext post:When is the best time to workout during the day?